Scientists at Loyola University Chicago say that tiny pieces of plastic in Illinois streams are home to a unique collection of aquatic microbes, including some that pose a threat to wildlife and human health. When Tim Hoellein and Amanda McCormick examined microplastics collected downstream of wastewater treatment plants, they found unusually high numbers of a bacteria family associated with gastrointestinal infections. The plastics were lined with more than 13 times as many Campylobacteraceae than organic material sampled at the same locations. The pathogen likely survived treatment by binding to plastic pieces too minute to be removed at the plants. Gene sequencing also revealed that microscopic debris skimmed from the 10 sampled rivers had been colonized by bacteria known for their ability to breakdown plastic and oil. 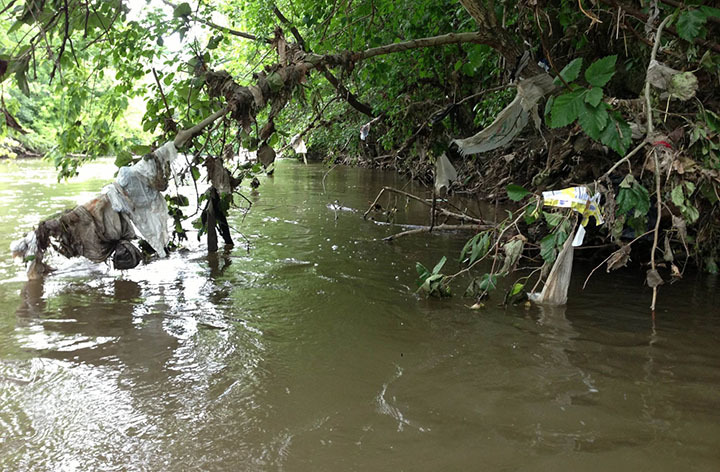 The study was conducted alongside efforts to quantify and track litter in five Chicago-area streams. For that project, Hoellein and McCormick adapted methods used to catalogue beach debris and trace insect movements. Plastic bags, bottles and wrappers made up the largest proportion of the discovered debris, with metal, glass and Styrofoam also in high abundance. And while more litter was found near the banks, debris taken from the stream floors weighed in at roughly double the mass. Altogether, the researchers estimate that 21-78 metric tons of human debris can be found in the study area at any time. But the exact makeup of the pollution is in flux. Continuous movement, he added, may help the plastics break down more quickly.